I have recently become a big Pinterest fan. It makes so much sense to me to have a site that people can use as a handy dandy file cabinet to keep track of ideas. My head is always FULL of ideas, so much so that I lay awake at night planning this and that or worrying about things. No joke, I have actually been sleeping more soundly with my imaginary bulletin boards set up on Pinterest for figuring things out in the daytime hours. It’s perfect for an obsessively creative, crunchy granola wanna be like me. It’s all there and there’s plenty of room for more. So strange to see me in a nutshell with the click of a button. One of the best parts about it is that there will be no lull in my culinary creativity around April like last year when I experienced a little cooking blog burnout. I have lots of cookbooks, most of them given to me by family members who know I like to cook, and I love them and learn from them. But when I am planning my menu I don’t surround myself with them until I come up with dinner for every night of the week and I am not a big user of recipe websites but I am loving the Pinterest world and all the facepalm moments I’ve have had when a recipe or food combination pops up that I never would have thought of. Most seem to be based around Crock Pot cookery, of which I am not a big fan, or refrigerator biscuits, which I would never buy, but others are scratch made, simple, elaborate, quick and easy, even meticulous and artistic and just plain darn good ideas. I don’t care about saving time in the kitchen. I don’t have anywhere I need to be for most of the week which leaves me plenty of time for making a mess and cleaning it up, but I do appreciate a simple, cute recipe from time to time. 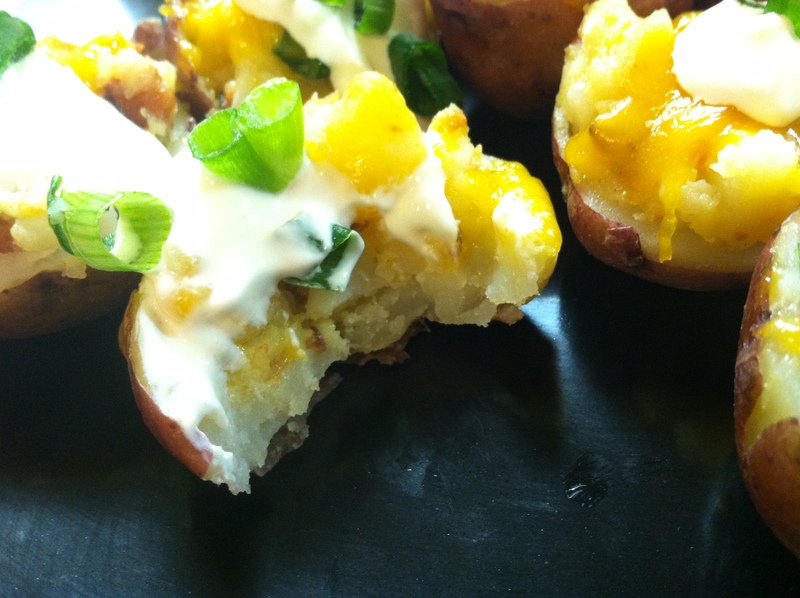 This recipe I did not see on Pinterest but found while perusing other cooking blogs on WordPress. 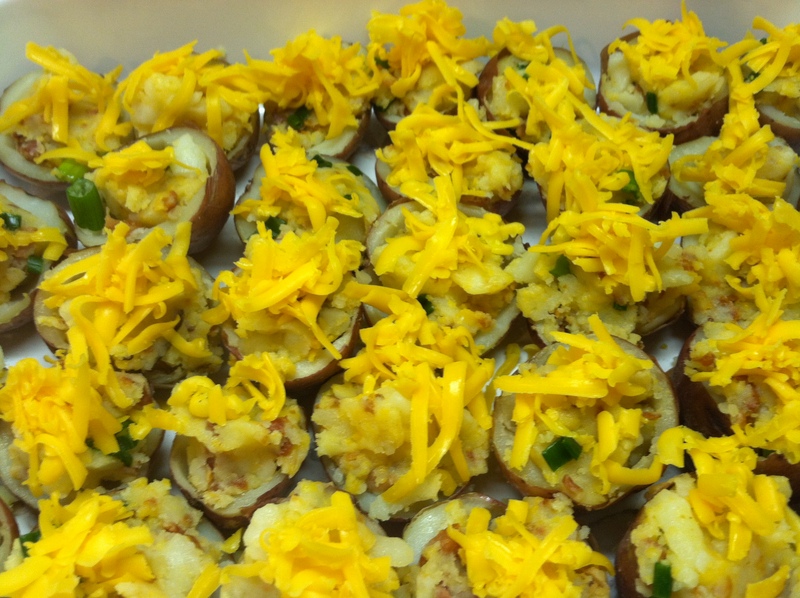 The author of Kitchen Chaotic was correct when she said, these are the “Cutest Little Potato Puffs Ever. Ever.” and I just had to make them when I saw them, especially since her photos were absolutely amazing as well as her idea. They accompanied little sirloin steaks my husband grilled for me the other night, inside…as in inside the house in the kitchen standing at the stove using my cast iron grill. That just doesn’t happen and sent me checking the calendar to see if it I had missed our anniversary or something. On top of it, mine was perfectly medium rare and absolutely beautiful! Why does food cooked by someone else taste SO much better? 2 lbs. 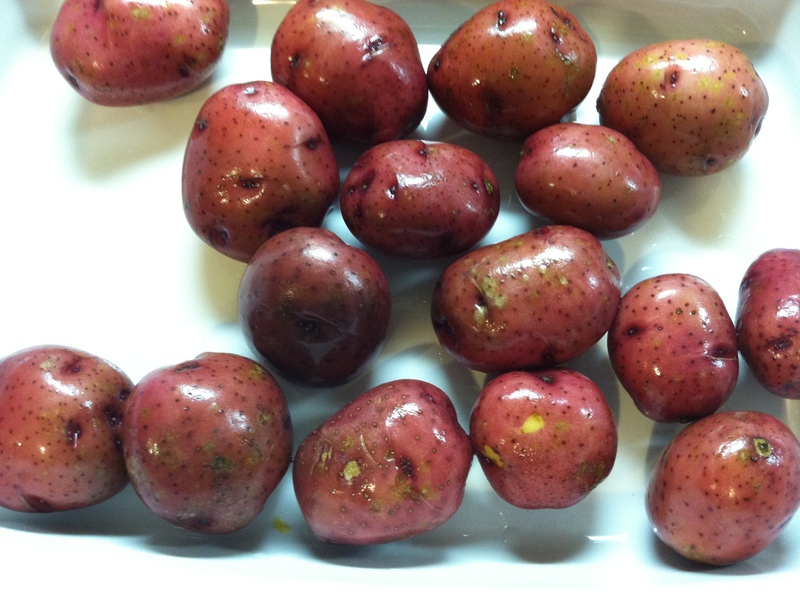 red new potatoes, enough to fill a 13X9X2 inch baking dish around 3/4 full. Heat oven to 350 degrees. 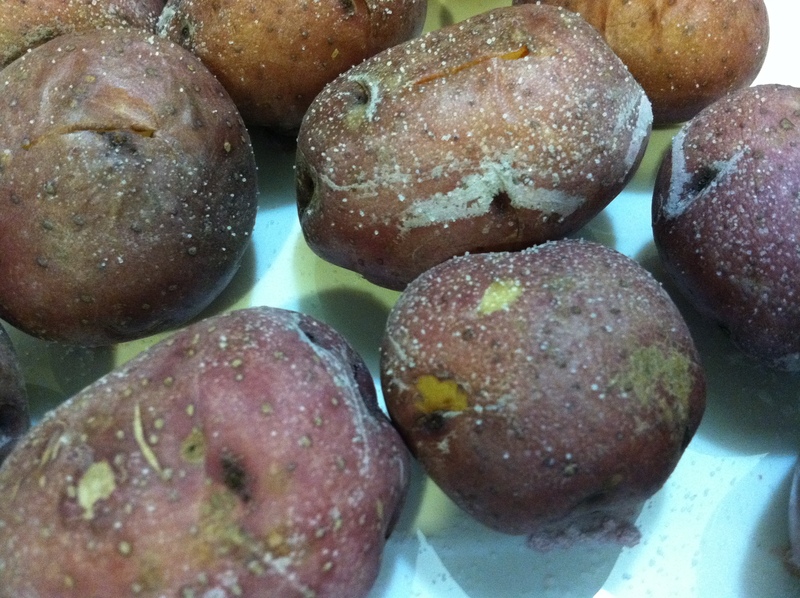 Place the potatoes in a baking dish and salt them well. 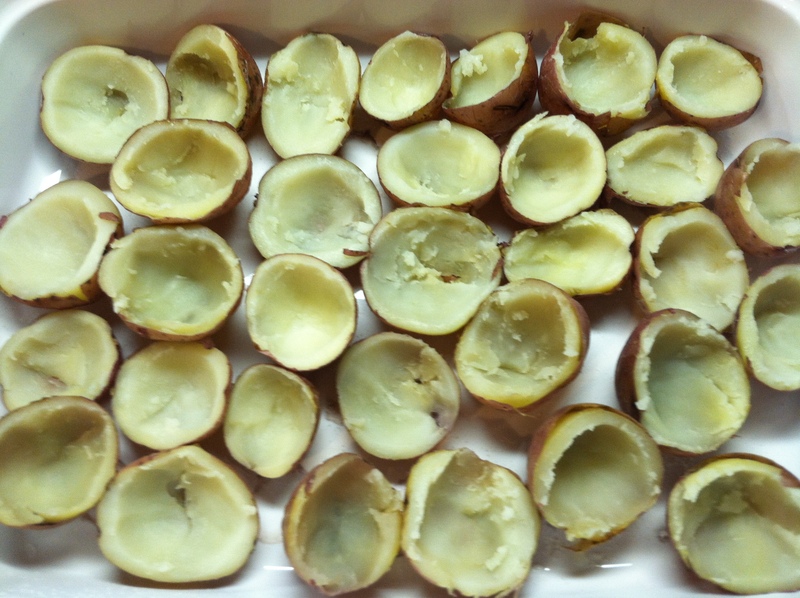 Cool the potatoes until they can be handled. 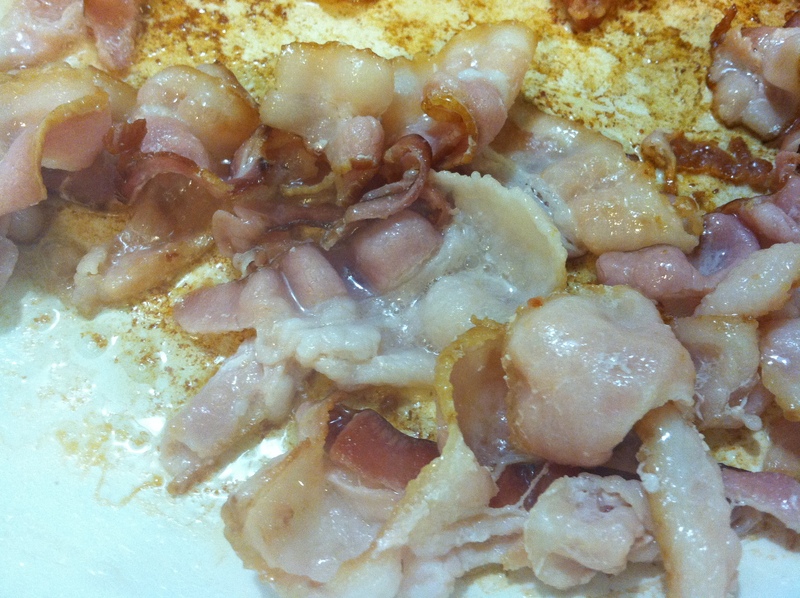 Cook the bacon until browned. Drain, cool, and crumble. 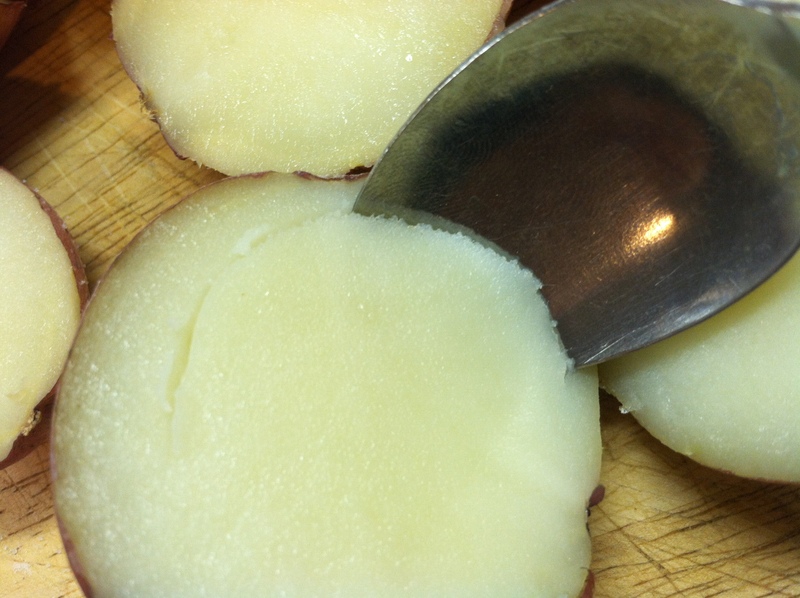 Cut each potato in half and scoop out the center with a spoon and place the scooped potato insides into a mixing bowl. 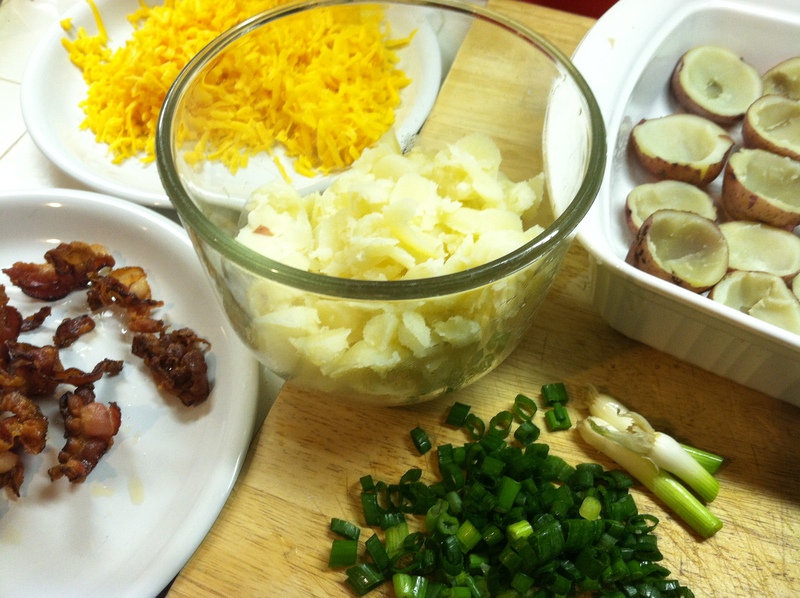 Add the bacon, 1/2 c. of the green onions, butter, and 1 cup cheese to the potato and mash together. 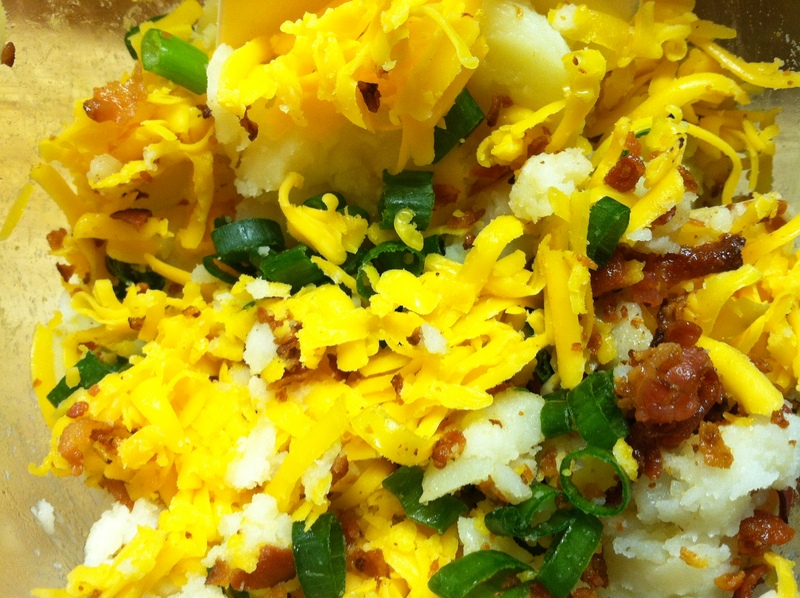 Spoon into each potato half. Sprinkle more cheese on top of each filled half and bake until melted. 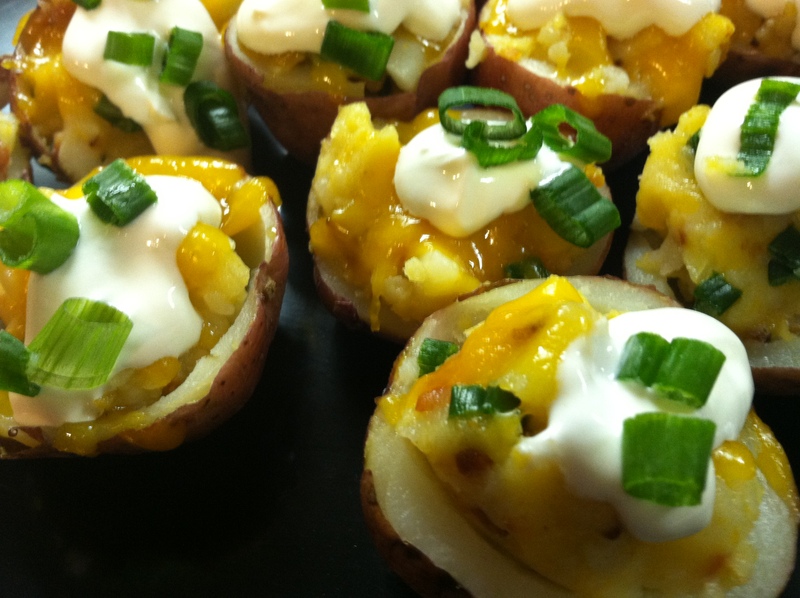 Garnish with a dollop of sour cream and reserved scallion slices. 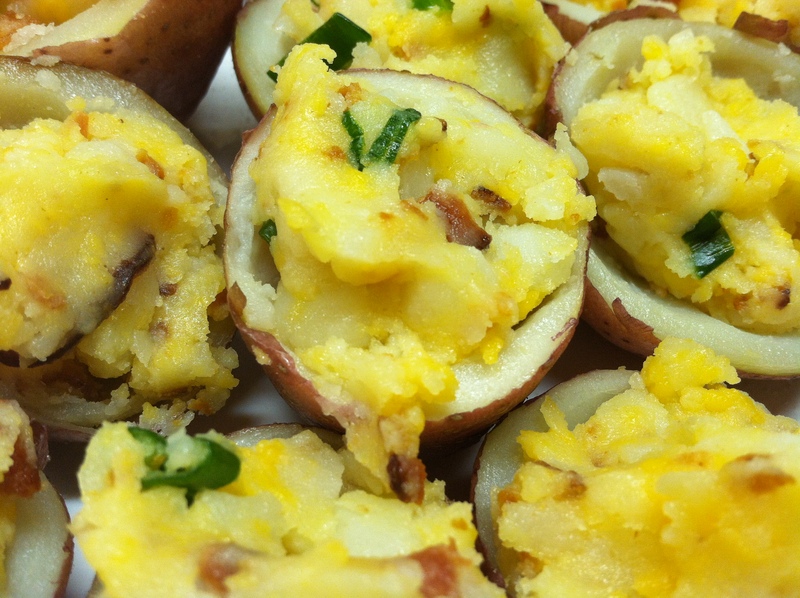 These would be great for a party, they were fabulous in place of a traditional stuffed baked potato with steaks, and I can imagine how wonderful they would be served as a brunch potato dish. New potatoes are actually my favorite potato. I will sometimes just eat a couple of small ones for lunch with a little butter and pepper. Yummy! I am saving this recipe though. Always neat to find something new to do with a food you love. Aw thanks so much- you made my day! I’m glad they turned out well for you I will definitely keep coming back to your blog, you have some great recipes on here!